Your bedroom should be a place of retreat – a calm, peaceful place of relaxation & escape. Unfortunately, the stresses of modern living tend to infiltrate and take over our peaceful oasis. 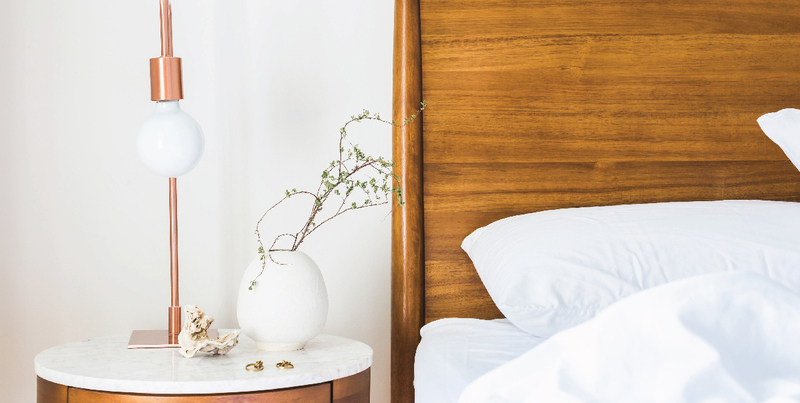 For the sake of your sanity and wellbeing, we have shared the experts tips for restoring your bedroom to the tranquil space you deserve. 1. Desk/work area – work brings stress into your bedroom. Find another space in your home to designate as your work/office area. 2. Unread books/magazines – Old books and magazines only pile up and collect dust. Not only does this affect air quality, but it also creates clutter which is known to promote feelings of stress. 3. Outdated gadgets – Clear out all of those old gadgets that never get used. You will never use them again, and they are only taking up space and collecting dust. 4. Receipts & Papers – Papers from our pants pockets tend to accumulate in our bedrooms. If they are important, file them elsewhere. If not, throw that clutter out. 5. Laundry basket – The smell of dirty laundry does not help create a nice fresh ambience in your bedroom oasis. The sight of an overflowing laundry basket also creates feelings of stress and overwhelm. Either move it into the bathroom, or ideally, the laundry where it belongs. 6. Items stored under the bed – it may be out of sight, but the clutter under your bed impacts heavily on the health of your bedroom. It traps dust, and restricts proper cleaning and air flow underneath your bed. Most items stored under the bed are not regularly used, and therefore you should consider donating or getting rid of them. 7. Clothes & Old Make-up – Free up clear space in your wardrobe by donating any items of clothing you haven’t worn in the past 12 months to charity. A similar rule applies for old makeup. Makeup harbours an array of bacteria, so don’t let it pile up in your cabinet! Once it has expired, dispose of it. 8. Old Pillows – if you fold your pillow in half and it doesn’t bounce back, then it is time to get a new one. Sleeping on a new, supportive pillow can improve your sleep quality greatly. 9. Snuggly Pets – as much as we love our 4 legged family members, it is highly likely they are the reason you wake up tired. Aside from a few hygiene concerns on pets sleeping in our beds, every movement your pet makes through the night affects your sleep quality & patterns. There are plenty of plush doggy bed options out there, so buy your furry friend their very own bed and you can look forward to feeling refreshed & recharged after a night of solid slumber. Once you have de-cluttered your bedroom space, don’t forget to give it a quick clean to create the ultimate relaxing ambience. Our Sanazone Odourless Disinfectant is a perfect choice to wipe over the bedroom. You can then pop your favourite Tri Nature essential oil in your diffuser for the perfect finishing touch. Click here to view our aromatherapy range.